This as if whets ones appetite for more. Dil chahe More.. more of these initiatives!! This is the first step in the right direction, the road to civic reforms in India long overdue and extremely bothersome. I am presently out of the country, in The US of A to be precise, but which does not automatically infer that I am away, oblivious and unaware of the happenings in my ‘watan,. Oh I keep abreast..thanks to the internet, my constant companion. Coming back to ‘more’ ..Potholes.. the bane of Mumbai. Solution Avoid toll nakas. WHY PAY TOLLS WHEN THE ROADS PROMISE HOLES? All the BMC does is claim ‘only 220 Holes in Mumbai. ONLY? and also, Why are they present 365 days of the year? A larger point is being made via this initiative. Yes the ministry of RR Patil has responded. But greater than that is the floodgates of mass activism opening. It stridently proclaims that the average citizen of Mumbai is ready for and willing to co operate in a cause that is as exploitory as it is maddening. God knows we have no dearth of causes in India. What we need are forerunners, not politically motivated but one from among you and me and thousands will follow. In other words.. modern day Pied Pipers and Gandhi-ists rolled into one. All it takes to jolt the Gandhi caps of their corrupt heads is a little bit of Gandhi-ism. Ironic but true. Oh they will jump out of their skins..inevitably. They love their chairs too much to ignore it when we as a populace come out of ours!! Apathy is outdated, archaic, anachronistic. Activism is the New Mantra..it works and HOW!! Mantri ji.. suniye Huzoor.. picture abhi baaki hai mere dost !! Great piece kaveetaa..long time..but welcome back. 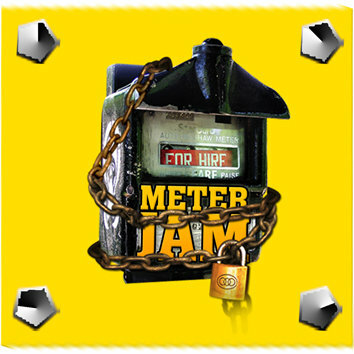 Bangalore and Delhi have one too now..I mean meter jam…good thing. Very true.What is more important is the opening of the mass activism.I hope this concept will gain momentum. Hoping too Chowla ji. From the looks of it …it seems to be here to stay. Ideas are like the first ripple which transform into a gushing, mammoth wave. Nice caption. “WHY PAY TOLLS WHEN THE ROADS PROMISE HOLES?” – HAHHAHAHAH 😀 Its great that your abroad and still aware, to be precise still reading Mumbai Mirror and TOI! Made for some really nice reading!